This new mini solar kit utilizes not one but two forms of alternative energy. 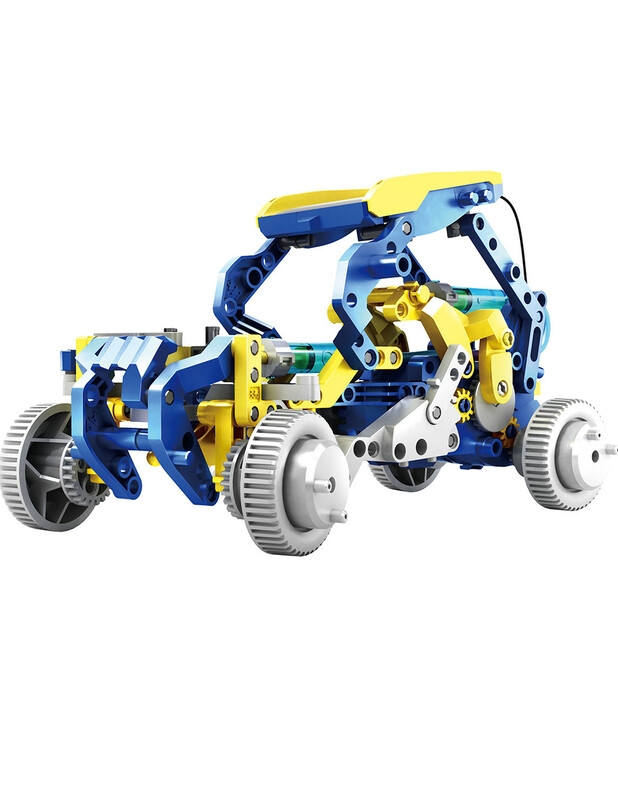 Dodeca 12 in 1 SolarHydraulic Robot will teach your child how to engineer a robot that uses solar and hydraulic (water) power in harmony while challenging manual dexterity and developing self-confidence. Dodeca 12 in 1 SolarHydraulic Robot's gear box is a true dual threat as it is powered by direct sunlight and a hydraulic transmission. No batteries are required! With Dodeca, children are able to actively learn two forms of alternative energy while they create and use their boundless imagination. With alternative energy playing such a pivotal role, there is no better time than now to start children on the path to learning basic concepts behind these technologies. Dodeca has 12 exciting forms that can be separated in two animated building modes: Automotive (Buggy, Obstacle Avoiding Rover, Excavator, Forklift) and Animals (Elephant, Pterosaurs, Monkey, Ostrich, T-Red, Crocodile, Scorpion, Dog-Walker). As the saying goes, "Our children are the future." And if anything is certain about the future, it is that renewable energy sources and green technologies will play a major role in our children's lives. Assembled dimensions: (Varies with build), 4.37" x 3.66" x 4.25" up to 8.97" x 9.01" x 10.15"